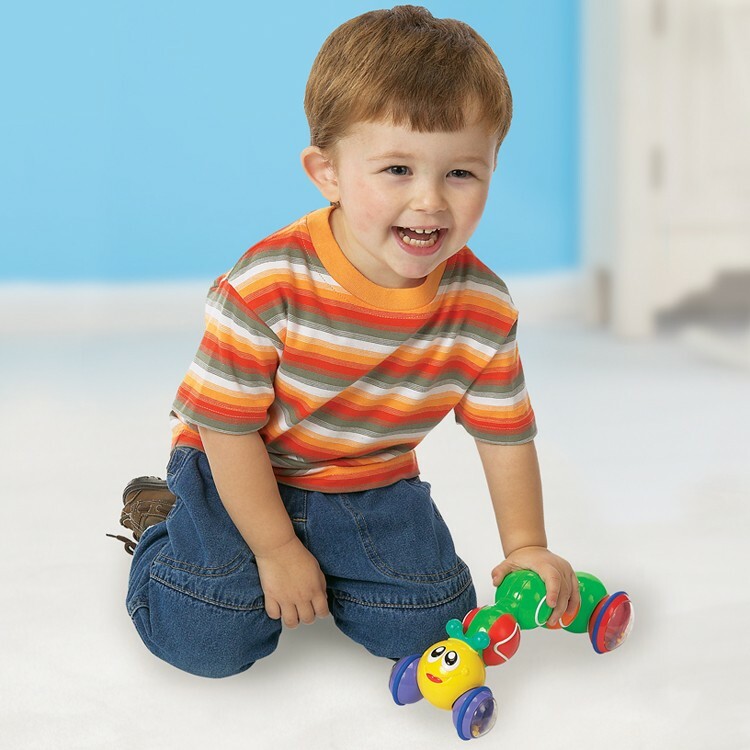 When your crawling baby or toddler pushes down on this toy inchworm, be prepared to watch the baby activity toy zoom across the floor! Award Winner: Oppenheim Toy Portfolio Platinum Award. A super exciting little worm for your super excited little toddler! 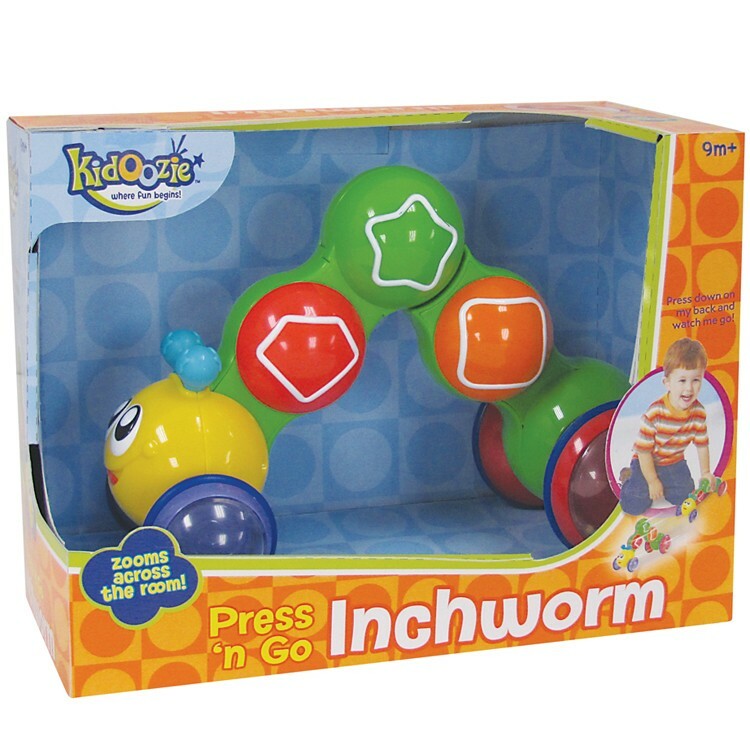 Press n Go Inchworm Baby Toy by Kidoozie is perfect for your crawling baby or toddling child. 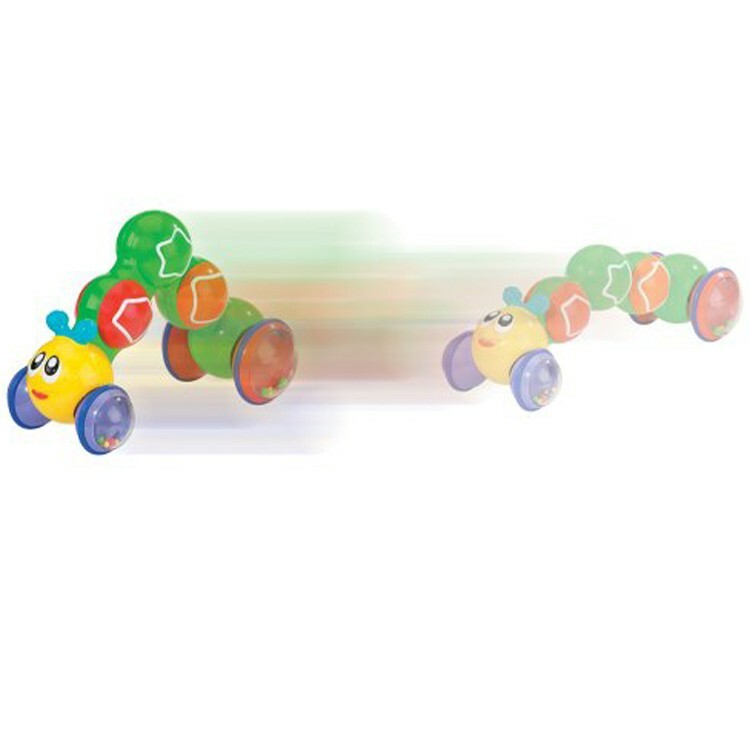 The brightly colored toy worm from Educational Toys Planet features a special bendable back. When you push down on the inchworm, be prepared to watch him zoom across the floor! Your child will be amazed by this cute character's speed and will be mesmerized by the colorful moving beads that spin around in the worm's wheels. The worm's back is covered in engaging shapes your child will love. 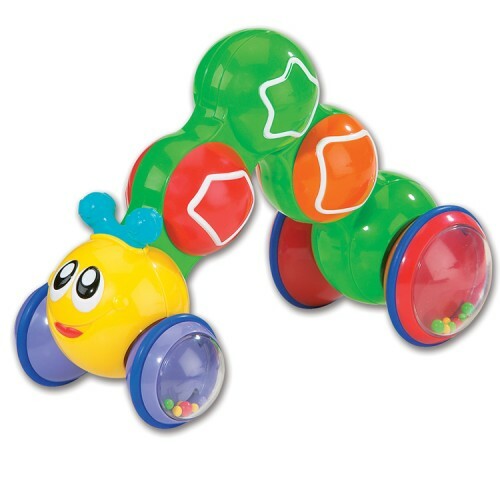 His easy to press back makes the Press n Go Inchworm Baby Toy great for long distance travel across the floor. A wonderful cause & effect baby activity that helps with both fine and gross motor skills. Dimensions of package 9.75" x 7.25" x 5"
Write your own review of Press n Go Inchworm Baby Toy. Rating: 5 by Julie, OH I bought this for my grandson. He love it. It really does go fast on our hardwood floors as well as the carpet. I like it because it is simple. No bells or whistles, just fun. Rating: 5 by sonya, IN my daughter plays with this toy all the time. she chases it around the room trying to grab it. Rating: 5 by Shawn, mom of 2, PA Really cool toy. At first my 10 month old was scared of it, then she warmed up to it and can't get enough of it. Rating: 5 by Patti, OR Amazing electronic kit for the older children. It was one of the best Xmas gifts for our boy. Rating: 5 by Emily, MO Kids love it!! Rating: 4 by Barbara, WA My son is almost 10 months old and he likes that when he shakes this one it makes noise but when I roll it on the floor he loses interest and does not chase it. He likes to play with it but as far as helping him crawl more it doesn't help him. He just likes to shake it. Rating: 4 by Marilyn, NY Lots of fun for my grandson and good teaching toy; also helps him with his coordination.